My sister, Collette, and her daughter, Emily, have been visiting us this week. They are both new to sailing. In just a few days, our lifestyle of cruising has left its mark. Collette remains vigilant about safety, but she no longer wears her life jacket in our galley. 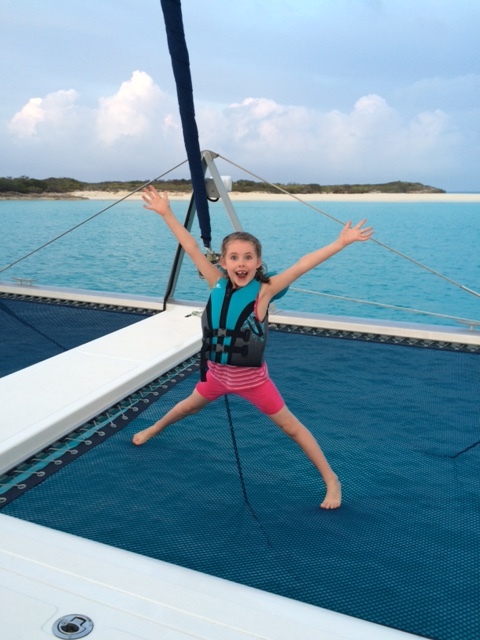 Six-year old Emily has sat at the bow of our catamaran and felt the spray of six-foot waves. She has used a bathyscope to observe a nurse shark. The word “Remora” is now in her vocabulary. Anchored at Pigeon Cay, our niece, Emily (6), enjoys our trampoline. My husband was taught from an early age that there is no such thing as “can’t”. It’s a point-of-view we try to impress on our children. Rick and I enjoy finding solutions to remove the obstacles that stand in our way. Sometimes the answers can be found by reading a good book, and applying what we’ve learned. In truth, I would prefer that Rick didn’t read Wallace Ross’ book “Sail Power: The Complete Guide to Sails and Sail Handling” while we are sailing in 25 knots of wind. But, it doesn’t always work that way. We are parents to young children. Time management is a challenge. We were thrilled to have Collette and Emily join us aboard. We wanted to show them some of the splendor of the Bahamas – the rugged landscapes, and the crystal-clear waters. In many places you can see the ripples in the sand at the bottom, even when the water is 20 feet deep or more. When our friends Dave and Nathalie suggested we visit the Jumentos with them we couldn’t pass up the opportunity. Collette took some convincing that our trip to the Jumentos would be a success. She had trepidations relating to safety. She worried that our boat might tip, or that we might hit a reef and bring on water. To be fair, Collette and Emily had a rude introduction to our cruising lifestyle. They arrived in rough weather and had an awful dinghy ride to our boat. With choppy waves, it was as if they were being beaten with a paddle while riding a bucking bronco. Emily was in tears. Collette told me that she wanted to open her mouth and scream. We had considered sending a water taxi to fetch them. But, I’m not sure that they would have fared much better. Given that disastrous beginning, we are glad that Collette agreed to try sailing. The Jumentos are remote with no services or cell phone coverage. You must be self-sufficient. Collette told me later that she felt like she was on the “Voyage of the Beagle” as we sailed with no land in sight. She was a bit on edge and although she sat on our bow, she silently wondered if a helicopter might be involved as part of an emergency rescue plan. You reach the Jumentos from Georgetown by passing through Hog Cay Cut at your own risk. The cut is very shallow and, if you draw more than a couple of feet, you must wait for high tide to pass through. Our draft (or draught if you prefer) is 4 foot 3 inches. We stayed close to Dave and Nathalie’s boat. While it was nerve-wracking to see so much exposed rock and reefs, we had no trouble passing through Hog Cay cut. Too close? Following Dave and Nathalie’s boat on our way to the Jumentos. After passing through the Hog Cay Cut our destination was Water Cay. When we arrived in Water Cay, Dave told us that the reef, and the nearby fishermen’s anchorage was home to sharks. Dave knows what he is talking about. He is an adept fisherman. He uses a Hawaiian sling to catch groupers, snappers, lobster and queen trigger fish. Dave told us that he was putting his fish guts at the reef so we wouldn’t be bothered by the sharks. Our anchorage was quiet with about six boats at anchor. This is a sharp contrast to the anchorage at Georgetown, which attracts more than 300 cruising boats in a single day. On our first morning, we were faced with a boatload of five energetic young children. Swimming seemed like a good idea. Three of my children – Betty, Paul and Karen – went swimming in the water. But, the splashing was short-lived. Collette was the first to observe a black shape shifting and swiveling by our boat. Although we couldn’t be sure that there was a shark, we were cautious and had the kids leave the water. The next day, however, it was sunny and Rick suggested the kids go swimming. It was only later, after everyone was out of the water, that we observed a nurse shark near our swimming area. According to Discovery, there have been 52 reported nurse shark attacks worldwide, none of which have resulted in death. The website HowStuffWorks provides an entertaining view of the nurse shark, and also cites 52 attacks with no recorded fatalities. We were excited to view the nurse shark and some Remoras (also known as shark suckers) with a bathyscope from the safety of our boat. It might sound very civilized but there was much clamouring to see inside the bathyscope. 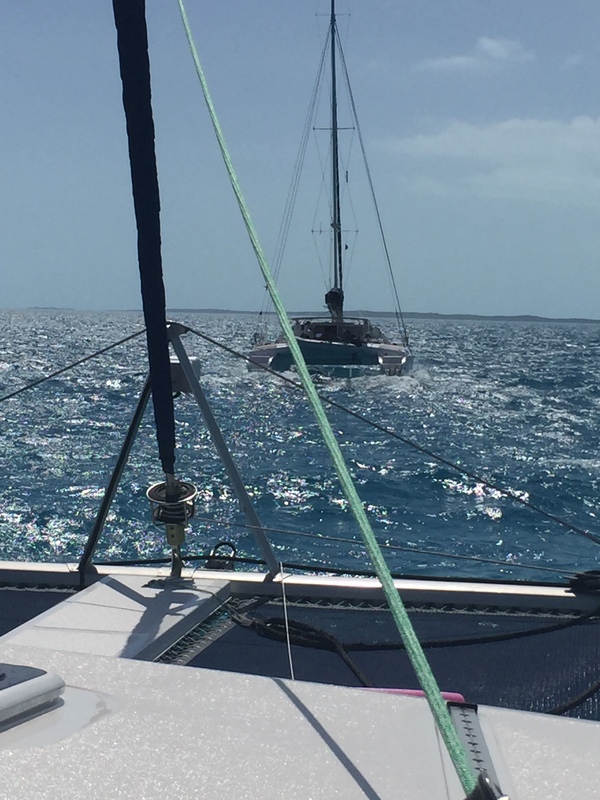 As we left the Jumentos, a sailboat in front of us got stuck on a reef going through Hog Cay Cut. Another sailboat assisted by attempting to tip their boat using a dinghy to loosen their keel. Fortunately, they were able to dislodge the boat. We are now back in Georgetown, and are anchored close to the dinghy dock. Collette and Emily left us this morning. As Collette stood on land she said the solid earth felt strange. Collette will be back at work on Monday in Victoria, B.C. She is already talking about her next visit, and has her sights on owning a bathyscope. Lorraine, I would be interested to know how your seasickness has been. Has it abated? I still need Dramamine. BUT I can manage on half a pill. The adult dosage is 1-2 pills. So there’s been some progress. I tried going without but had unfortunate results. I am so proud of my two daughters. Lorraine for embarking on the voyage of a lifetime with her husband and four children on the Aphrodite, their catamaran to see the world for themselves while most of us only dream and view it through National Geographic . And to Collette for her adventurous leap with Emily, on less than 4 days notice to travel to the Bahamas to meet her sister in port in the Bahamas. Read about their amazing voyage in Lorraine’s blog.